Prepare for the event of culinary and cultural indulgence. On March 20th from 3pm to 8pm, Wine, Dine & Design promises to be the region’s most exclusive sip and savor event for an extraordinary first year ticket price. Meet the vintners, the artists, the chefs, the designers. Wine, Dine and Design welcomes aficionados of fine culture to experience an evening of premium wine tastings presented by notable winemakers of California and France. Savor gourmet tastings and meet the region’s most celebrated chefs. Indulge in a captivating showcase featuring the region’s respected artists and interior designers. * Fine art, design and music can be enjoyed from 3pm to 8pm, open to the general public. * Plus a Champagne toast raffle, purchase a $10 glass of Champagne for a chance to win a $1000 piece of fine jewelry by Judith Ripka. Event proceeds will benefit the American Red Cross for Haiti Relief & Development and the Damon Runyon Cancer Research Foundation. 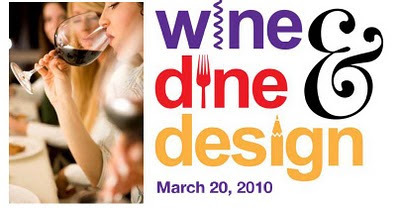 For Tickets, Latest News & Information please visit: http://www.winedineanddesign.com/ or call 561-624-8777.